Brian Burke, president and general manager of the Toronto Maple Leafs, announced Thursday that the team has acquired forward Philippe Paradis from the Carolina Hurricanes in exchange for forward Jiri Tlusty. 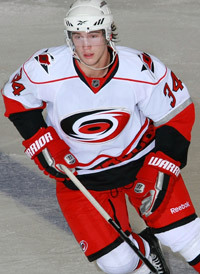 Paradis, 18, was selected by Carolina in the first round, 27th overall, in the 2009 NHL Entry Draft in Montreal. The 6-1, 206-pound native of Normandin, Quebec has registered 19 points (8 goals, 11 assists) and 43 penalty minutes in 26 games with the Shawinigan Cataractes of the QMJHL this season. Paradis has played 137 games with Shawinigan over three seasons (2007-2009), posting 38 goals and 54 assists for 92 points with 161 penalty minutes.